The Imixs Admin Client is a Web Front-End to administrate an instance of the Imixs-Workflow engine. 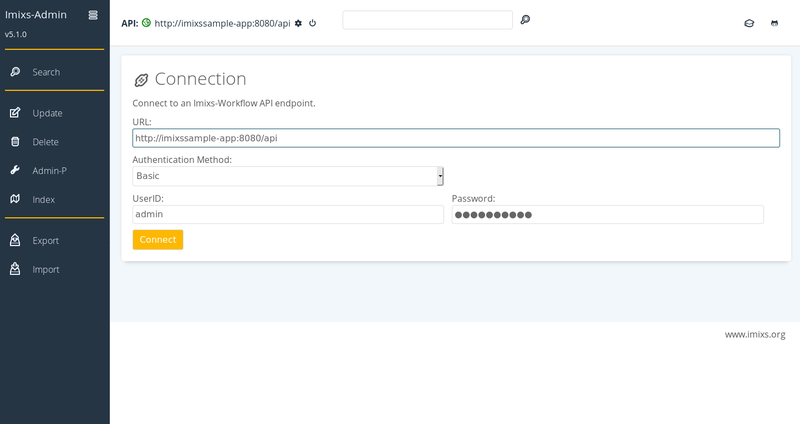 The Client can be connected via the Imixs Rest API with an instance of the Imixs-Workflow engine. The Imixs Admin Client can be deployed on any Java EE Server to administrate different instances of the Imixs-Workflow engine running on the same host. The Imixs Admin Client requires the user to authenticate with a valid security realm. The authenticated user (Administrator) needs at least the the Role “IMIXS-WORKFLOW-Manager”. The default security realm used by the Imixs Admin Client is “imixsrealm” which can to be configured on the Application Server. To connect to an instance of the Imixs-Workflow engine the corresponding Imixs Rest Service URL need to be entered. 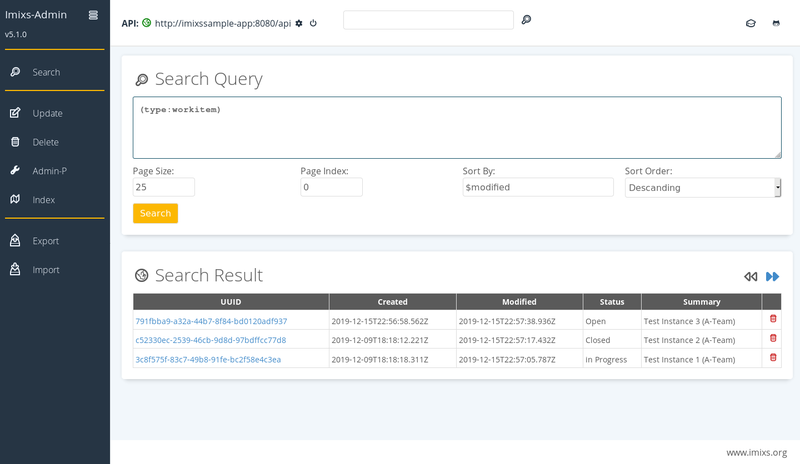 Next the client can be connected to the Imixs-Workflow engine to query data using a search terms. See the section Query Syntax for further details. 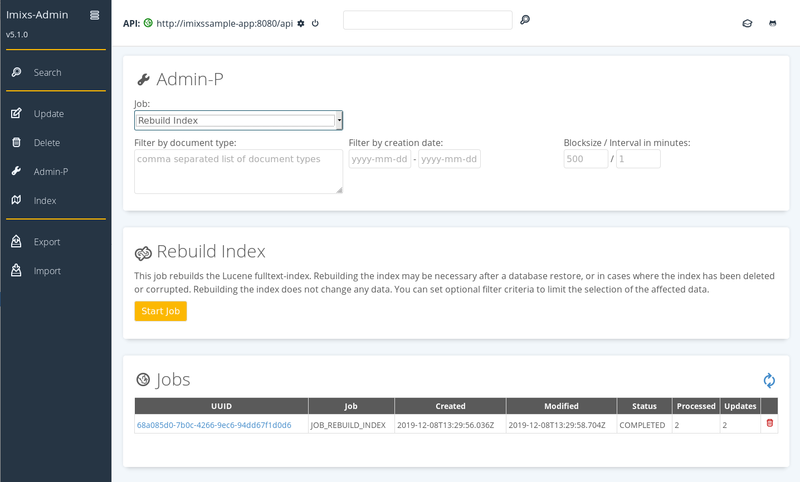 The Imixs Admin Client provides a interface to update or delete entities (Workitems) managed by the Imxis-Workflow engine. 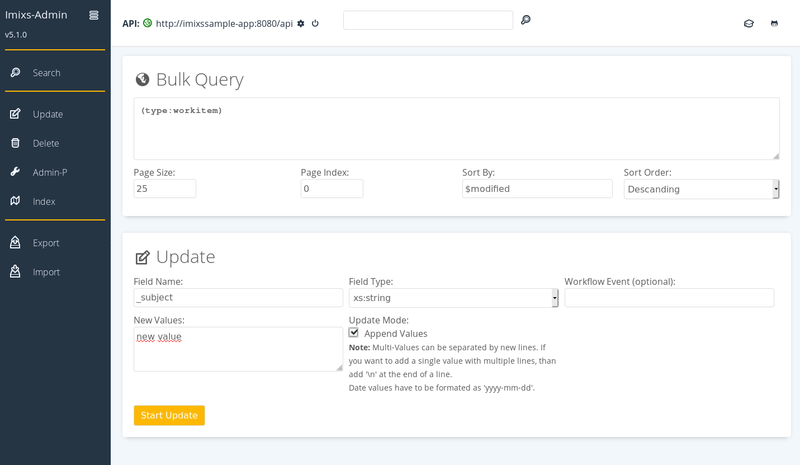 It is possible to run bulk updates on a result set to update a single item or to process workflow instances with a specific workflow event. The administration process provides a feature to migrate a business application from Imixs-Workflow version 3.x to 4.x. This feature is for migration purpose only. With the Backup feature it is also possible to export entities into a file system and later re-import them into any exiting workflow instance. To backup a collection of workitems a search term can be specified.